This tutorial is part 4 of a 6-part tutorial covering sweater knitting techniques for the Gramps cardigan. To view the other parts of the tutorial click on the links below. At the end of Tutorial 3 we completed the yoke of the Gramps cardigan. So far it doesn’t look like much, but I assure you that we are well on our way to completing an outrageously adorable baby garment! Last week’s tutorial covered how to cast on and knit the yoke of the sweater. This week we will be knitting the body and arms, which are quite straightforward. Once you have knit the across left front, and put the arm stitches on hold (by using a blunt needle to thread a piece of waste yarn through them), you cast on stitches for the underarm. This can be done a couple of different ways, but I suggest the backward loop cast-on method. Your yoke is now split into body and arm stitches, and if you squint your eyes and imagine, you see that the strange piece of knitting is beginning to take the shape of a cardigan! At this point you can count your stitches to be sure that you now have the correct number on the needles. The body of the cardigan in this case is very simple; follow the pattern and knit the majority in stockinette stitch, then switch to your contrast colour to work the ribbed bottom band. I suggest that you bind off ‘in pattern’ on the wrong side (WS) of the work. Binding off in pattern is simple; as you are binding off, you work the stitches as they lie before binding off. So if the stitch is a knit stitch, you knit it, or if it’s a purl stitch you purl it, before binding off as usual by lifting the first stitch over the second stitch and off the needles. Voila! You now have a sleeveless cardigan! Time to give it some sleeves. You will knit one sleeve at a time. To begin, put the stitches that you have on hold on waste yarn back on the needles. You can do this by inserting your needle through each of the stitches, following alongside the waste yarn. I used DPNs (double pointed needles) to make my sleeves but you could also use a long circular and the magic loop method. Held sts are picked up and placed on the needle. Once all of the sts have been picked up I remove the waste yarn. Once you have your needles (3 needles if you are using DPNs) through all of the stitches, you can pull the waste yarn out. wrap around the needle, and use the needle to pull a loop through the fabric to the right side of the work. For my size I am picking up 2 stitches, placing a marker, then picking up 2 more stitches. Stitches have been picked up and I know the BOR comes between the blue and yellow needle at the center of the underarm. Because I use DPNs, I don’t place a marker, I just know that the beginning of the round occurs in the middle of the underarm. If you are using the Magic Loop method, you will want to place a marker. Tip: After working 2 rounds I place a locking stitch marker at the underarm to make it easy to measure my sleeve length. I simply measure from the stitch marker. To work the sleeve follow the pattern, knitting each round until your sleeve measures a specified number of inches. Then you will begin your decreases. For my size I will be working these 6 rounds (decrease +5 knit rounds = 6 rounds) 3 more times (a total of 4 decreases) and I will end up with 32 sts. Continue following the pattern until the sleeve is the specified length (if you are knitting for a wee one you may want to add an inch or so and fold up the cuffs for extra sweater longevity, but this will take a little extra yarn). Switch to your contrast colour to work the ribbed cuff the same as at the bottom of the body. Then work the second sleeve the same as the first! 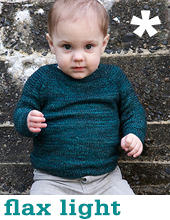 Voila – now your project actually looks like a tiny little sweater! The body and arms are done, and there are only a few finishing touches before this über cute project is complete. In the blog posts to follow, I will take you through the rest of the steps required to knit the Gramps cardigan! Is there anything I covered that is unclear? Did I miss any important points? Please let me know what you think of these tutorials, and make suggestions for other tutorial topics by posting comments, or contact me directly. Be sure to subscribe to the blog by email to receive each post as it goes live, right to your inbox! Hi Heather – You can check out our help page for all of our full sweater tutorials. Est-il possible d’avoir ces explications en français ? I have a question about picking up the underarm stitches. Typically, I have seen that stitches are usually picked up by inserting the needle directly into the “V”. I see that there are 4 “V”s in my work, which makes sense since I cast on 4 stitches. The pictures above seem to indicate that you should instead pick up between the “V”s. In that case, there are 5 spaces between the “V”s so I am a little confused. In the picture above, it looks like there should be another stitch to the left of the 1 – is it supposed to be asymmetric? Hi Fresia – I would say both will look fine, my underarm looks good the way I did it above, but your way is just as good! Gramps cardigan is such a great pattern and sweater. But, I have big holes at the underarm where I added the 4 stitches. It looks like such a large expanse for only 4 picked up stitches. Any advice on how to avoid the holes? Thanks. Hi – the number of sts picked up is equal to the number of sts cast on at the underarm. Remember that you are going to pick up some sts, PM, then pick up MORE sts at the underarm. Hi – not to worry, I’m sorry, this tutorial has slightly different numbers than the current version of the pattern, the numbers in the pattern are correct. The original version (which only included childrens sizes) had a provisional cast on but the pattern no longer has that. Muy bueno el tutorial, yo particularmente los saco mejor con el dibujo, poniendole los datos de cantidad de puntos y demas en el croquis mismo del dibujo, soy de Montevideo URUGUAY, FELICITACIONES, ME ENCANTA ESTA PAGINA !!!!!! Gracias!!! When you are working in the round, stockinette is achieved by knitting every round. Knit away! When separating for the sleeves you want your extra sts to come at sleeves only (the sts you are putting on waste yarn), the body sts will stay the same and the cast on number at the underarm will stay the same. When you go to do the sleeves you can work the instructions for the next size up. I’ve made it through knitting almost all of yoke section. Have a question about directions (before separate sleeves and body), “place locking stitch markers or safety pins in the fabric at the beginning and end of this row.” ???? Which row do I do this— Is it at thebeginning of working # rows for size, in stockinette stitch/yoke depth measures etc., Then put marker/pin at end of this row too? Thanks for your help! The row that you are on, place a safety pin in the first and last stitch. Thank You for answering. Don’t think my brain was thinking very clearly when posting! Just put safety pin and moved on! Am wading into waters unknown having put stitches on waste yarn to hold for sleeves!!! Looking so cute and taking shape of sweater! Thanks for being such a great and inspiring teacher!!! Hi – I’m knitting the 4-6 yr old size – I’ve completed the body and am starting to work on the sleeves. Reading the instructions and your explanation in the tutorial of June 15 seems contradictory to me. I’ve placed my stitches back on the needles, THEN I knit a row, THEN pick up 6 stitches from the underarm .- is that correct? I end up with a hole between the stitches that were on the needle and the new picked up stitches. It almost seems as if I should pick up 8 stitches so I don’t have a hole. Or does knitting the row first and then picking up the 6 stitches leave a gap? I love your tutorials, they’ve really helped me through unknown territory. Thanks – I did pick up an extra stitch on each end and still have a little hole, so will sew them closed when I finish. Hi and greetings from S. Wales,UK. I have just found your blog and Google+ website from a link on Cats Rocking Crochet blog and must say I adore what I’m seeing so far (haven’t had a chance to check out the rest of what seems a fab blog yet). 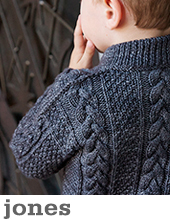 Thanks so much for this easy to follow pattern for the Gramps baby cardigan. I haven’t made one yet of course but I’ve checked out your instructions and they are so clear and precise that I know I will enjoy making this up for my newest baby grandson. I haven’t been able to keep up with my blog for almost two years due to ill health so I haven’t linked to it, also my blog is mainly cardmaking and papercraft. Funnily enough my I’ll health is the one thing that drew me back to my first loves of crochet and knitting. Isn’t it funny how things that happen in our lives can totally change our needs for a while. I haven’t given up papercrafting, will be back at it hopefully in the next few weeks as I’d like to make my Christmas cards again now I’m feeling a bit better. Anyway enough of me, thank you again for your kind gift of the free pattern to the web. I shall be back to look around the rest of your blog for certain. I loved ur tutorial and the way u explain in detail please tell me after picking up the stitches in the armhole why did u mark center how does that help? What is center marking for ? You mark the centre stitch of the underarm stitches because it will be the first stitch of the round (your BOR or beginning of round). So when you follow the pattern, and work decreases at the sleeve, the decreases will be made either side of this marked stitch. Can you tell me what yarn you are using in this tutorial as well as the names of the colors? I love it! Why are the arm stitches inside of the raglan increases, rather than divided in the middle of them? In your photo on this page they appear to be divided in the middle of the “seam,” but in the Gramps pattern they are not. Is there a specific reason? just the way the numbers worked out for that particular pattern. I haven’t knitted in years, and am picking it back up. This is the first time, however, where I have done raglan sleeves this way. What I am confused about is how to add in the new yarn to work with for the sleeves. Place your stitches on your double pointed needles (or a long circular for magic loop). Using new yarn in MC knit across your stitches. I do this by leaving a long tail and just knitting with the new yarn. The first few stitches are a bit loose but you can tighten them up later. Hi, i purchased gramps baby cardigan! I’m so glad this pattern is very easy to follow! However, i’m stuck at arm part!! i know how to pick up stiches but i’m so confused how to do next step. I’m using circular needle and there are 5 pickup stiches on my right needle and 33sts on hold. do i have to knit 33sts? so 38 sts on right needles together? i mean 5 pickup stiches goes bottom and 33sts on top of right needle. then, what is the exact meaning of 2(2,3,3)of the 5 (5,7,7) picked-up sts?? I’m so confused! please help me! 2) Place the held stitches back on needles, then knit around on them, so you will have the picked up stitches + the stitches that were on hold, and be at your total stitch count for the upper arm. 3) Lastly, knit 2 (2, 3, 3) of the picked-up stitches once more. Then stop. Then is the new beginning-of-round point, at the underarm. From there you proceed to work the sleeve following the instructions. Does this help? thank you for quick reply!! :)so there are pickedup stitches on bottom and other stitches on top.and as you mentioned, [to knit 2 of pickedup stitches] , my all 5 pickeup sts are already on the bottom part so do i need to move sts to other side needle to 5pickedup sts goes on top part? sorry! the reason I am confused is that first schematic says to knit across the back, put the arm on hold, then cast on the underarm, but below second schematic says “you will then knit across the back, then cast on stiches for underarm and put arm on hold” – opposite order than before. See my comment below regarding the order of casting on underarms and placing sleeve sts on hold. not sure, are the 5 underarm stiches staying on the needle to be P on WS or do they get put on hold with the arm? This set of instructions was EXACTLY what I needed today. I’ve been puzzling over the instructions for my first top down cardigan. Your photo How To Separate At Underarm was just what I needed to see. I think the cardigan you are knitting is very cute, and I’ll put it in my queue. Picked up your site from Pinterest. Such an informative post! And what a cute sweater.